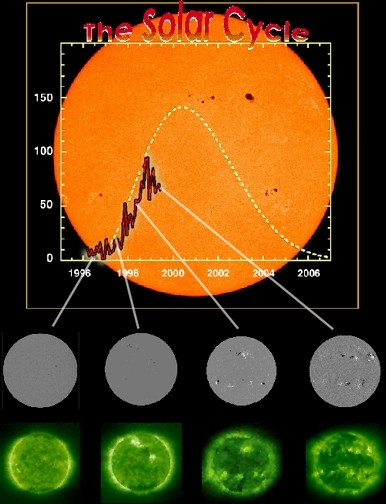 The suns 11 year solar cycle as reflected by the number of sunspots recorded to date and as projected (dotted line). Selected EIT 195Å and MDI magnetogram images are shown. In this cycle the Sun undergoes a period of activity called the "solar maximum", followed by a period of quiet called the "solar minimum." The rising level can be clearly seen in the comparison of EIT and MDI images. The current cycle, Cycle 23, is the 23rd systematically recorded since sunspot observations began in the 17th century.